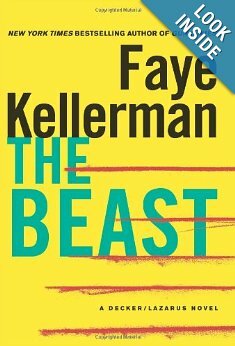 I just finished the book “The Beast” by Faye Kellerman. I am a big fan of Faye Kellerman and her husband Jonathan Kellerman. They each write their own thriller series, one starring a homicide cop, and the other staring a psychologist who works for the police. This book fell a little flat for me. It’s the 21st book in the series, and you don’t necessarily have to read them in order, because each story is new, (but the main character’s life events will be out of order). But the ending felt anti-climatic. I have very few authors I’ll by hardcovers from anymore, and prefer to wait for the paperback, but now that I have my kindle it makes things a little easier, so I decided to go ahead and get this one, but they can still be damn expensive. The main character, Peter Decker is a Lieutenant for the LAPD. He works closely with his sergeant and detectives to break open the case regarding a murdered old man who had a Bengal Tiger for a pet. Decker’s not afraid to get his hands dirty, and get directly involved in each case, and at one point he even made a phone call to the main character in her husband’s (Jonathan Kellerman) book. I think that may have happened before, but after 21 books, I don’t remember that. If you like a good mystery, give this one a try, but the ending might leave you a little disappointed. It almost seemed like she was wrapping up the series with this book too since Decker is thinking about calling it quits with the LAPD and finding a quieter smaller town to work in. As much as I like Faye, I like her husband better, so if you’re going to read one of them, I would look into the Alex Delaware series.